In a recent interview, Blizzard senior producer John Lagrave said "it would be foolish for any game developer to not be looking " at getting their game onto the iPhone, and admitted that they have been exploring how to get World of Warcraft into the mobile interface. There are particular systems of the massively multiplayer online fantsy game that they could conceivably transfer to mobile; specifically, Lagrave said fishing is something that could make the cut, as well as pet battles, a feature coming in their next content expansion. Of course, he also says that there are challenges they have yet to conquer. We won't do it until we think it's decent. ... Maybe we'll stumble on the great way to put WoW on the phone - maybe we won't, but we're certainly looking into it. ... When we have an epiphany, everyone will know, but for now, no epiphany! 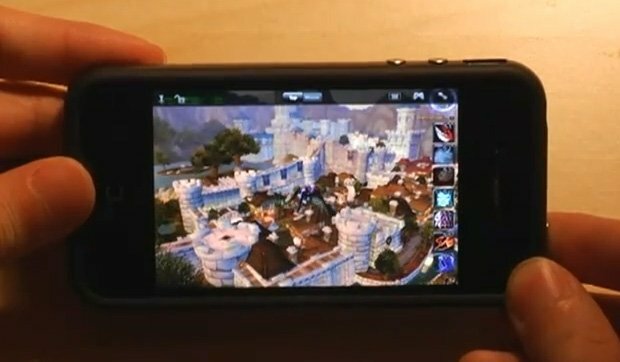 We've seen WoW on the iPhone through cloud gaming services similar to OnLive (or VNC work-arounds), but a proper mobile client would be awesome. The new iPad may very well be the point where a mobile device will be able to handle the full graphics capabilities that such a game has to bear on its own, but there would need to be at least a little bit of scaling down; the current install on PC takes up 25 GB, which isn't an amount of space most folks can spare on their iPad for a single game. Blizzard has already been active in the mobile world through their Remote app for iOS and Android, but they're charging an extra $3/month on top of the $10/month subscription fee for the privilege of selling loot on the auction house and chatting with guildmates while on the go. If Blizzard ever did get around to bringing the full (or even parts of) World of Warcraft to the iPhone, I hope they would just include the features in the existing Remote app rather charging even more. Otherwise, they'll have a hard time competing in the mobile world where free-to-play with a side order of microtransactions is a common sight. Beyond that, Blizzard also has a mobile authenticator app to add extra protection to your Battle.net account. Until Blizzard gets around to making this happen, Gameloft has a decent clone called Order and Chaos on sale for significantly cheaper than what you would pay for WoW.